Launched May 26, GetMyFuture also offers specialized resources related to foster-system involvement, addiction, homelessness, teen parenting, or a lack of financial, family or community resources. Interest Assessment – an easy-to-use 30-question assessment matches your interests to potential careers. You can explore your interests and link to profiles of the careers that come up on your results. Easy to use on phone, computer, or other device. Occupation Profile – details about careers include tasks on the job, wages, expected growth for the career in your location, required education, and a video of people working in the career. Videos – success-story videos of young adults who have overcome barriers to achieve education or career success. Want to work for yourself? Find resources on starting a small business or providing your services directly to customers. Haven’t had a job before? Find ideas for first jobs, and the work documents you will need to apply. Need work experience? Learn about different ways to gain experience you will need to qualify for future jobs. Struggling to finish high school? Get a new perspective about completing your diploma and how to gain the most from the experience. Want to apply to college, but have no idea how to begin? Learn the steps and timing for applications to college and financial aid. 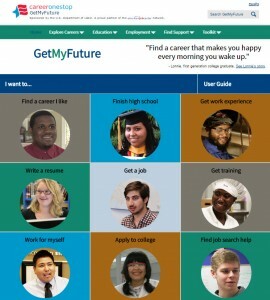 GetMyFuture.org is sponsored by the U.S. Department of Labor’s Employment and Training Administration. The website features data from the Occupational Information Network (O*NET), the Bureau of Labor Statistics, the U.S. Department of Education, and other federal sources.